Post full size photos and videos to Instagram without cropping! Move, rotate, scale, flip and Edit your photos and videos. Best photo and video editor for Instagram. 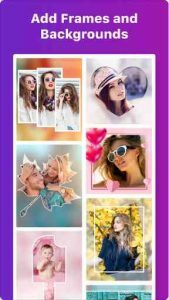 Use Awesome filters, blur backgrounds, stunning Shapes, pattern borders, frames, stickers and text. And High resolution output. Blur Backgrounds: All Possible blur effects. Gaussian blur, Motion Blur,Pointillise Blur, Zoom Blur, Hexagonal Blur, Crystallise Blur, Black & White Blur and many more. Backgrounds: Huge collection of Pattern, Color and Gradient Color Backgrounds. Frames: Huge collection of stunning shape frames. Creative Borders: Give your pic or video a border to make it stand out. You can keep it simple with a square, or experiment with heart, circle, many pointed stars and more. Your friends will be amazed! Text: Quickly add text to your photos and videos with over 50 professional fonts. Sticker: Express your emotion with cute stickers and emojis. Music: 50+ Background musics for your video. Make your video live. Editing Tools: Edit your photos as you like. Share: Share your creation at Instagram, Facebook, Twitter, email and more. free trial – free of charge; no commitment; cancel anytime. Free for first 03 days, then $1.99/week. Subscription automatically renews unless auto-renew is turned off at least 24 – hours before the end of the current period. Any unused portion of a free trail period will forfeited when the user purchases a subscription. Subscriptions may be managed by the user and auto-renewal may be turned off by going to the user’s iTunes Account Settings after purchase. Subscription can be cancelled during its free trial period via the subscription setting through your iTunes account. This must be done 24 hours before the end of the subscription period to avoid being charged.